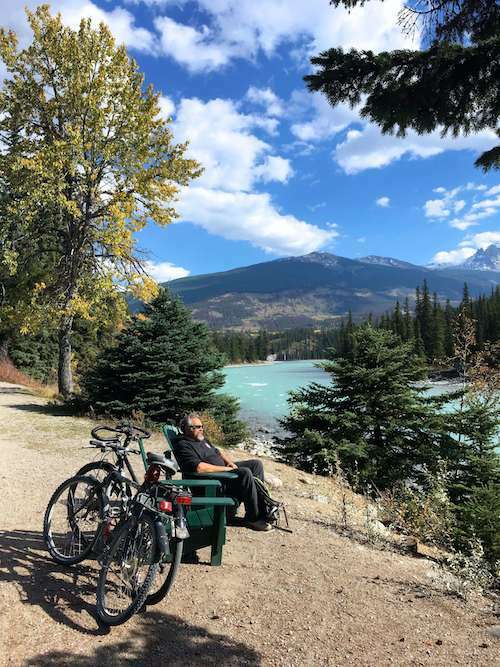 One of the biggest advantages to camper travel in Banff and Jasper National Parks is the ability to pull into a campground when you start to feel tired, rather than having to plan your day around a hotel location. Plus, if you can’t find a campground there are plenty of turn outs and parking lots where you can park overnight. Here we give you the low down on campgrounds and overnight parking in Banff and Jasper National Parks. Camping in Banff and Jasper is, in our opinion, one of the best ways to enjoy the natural beauty of these areas. The campgrounds vary widely in size and amenities from huge RV-friendly campgrounds with hundreds of sites and full hookups, to small campgrounds with few amenities nestled in areas of pristine nature. We prefer small campgrounds with beautiful campsites (and few amenities) to the larger amenity-packed campgrounds. However, we stayed in all types of campgrounds on our visit, and will share our impressions with you. Tunnel Mountain Village Campground is the closest campground to the actual town of Banff. It is just a couple miles from the center of town, and you can hop a shuttle into town if you don’t want to drive your camper (we highly recommend utilizing the shuttle service, as getting around town is difficult in a camper). The campground is HUGE with hundreds of sites. 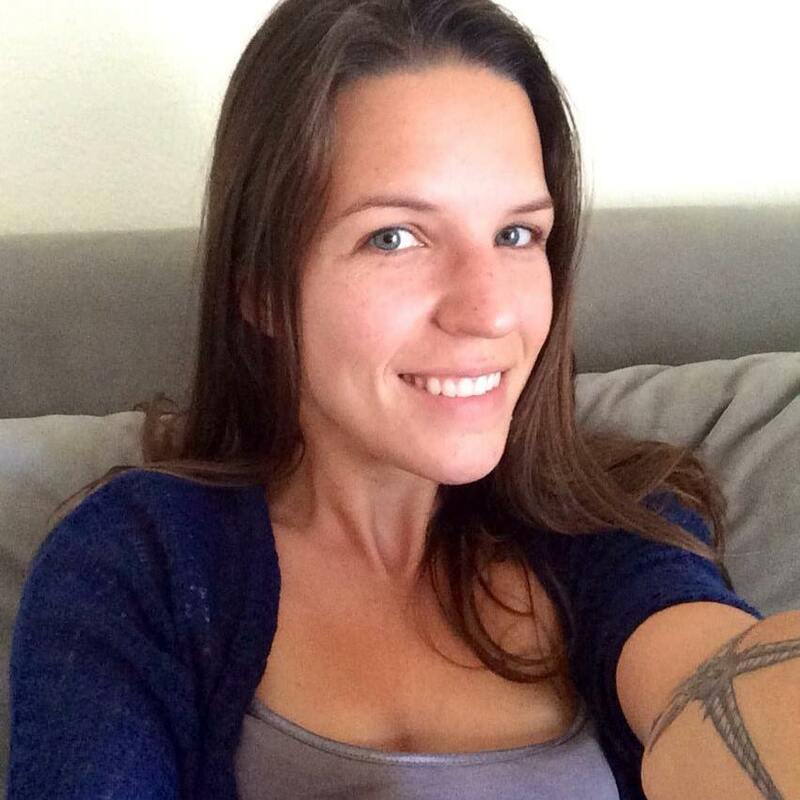 You can choose whether you would like a site with a fire pit (required if you want to have a campfire), a site with water/electric hookups, or just a basic site with neither of these options. We stayed in a basic site that did not have hookups or a fire pit. In Canadian national parks if you want to have a campfire you pay for a nightly campfire permit, and then you can use as much of the provided firewood as you want throughout the night. We chose not to spend the extra $8 for a fire permit, but we did feel that this system was FAR superior to U.S. national parks because it insures that visitors only burn local wood, AND it allows you to have a fire all night for a set price. The bathrooms in Tunnel Mountain Village were modern and clean with hot showers. There were also food lockers available for tent campers, or anyone who wanted to stow food safely away from animals. Grizzly bears are commonly spotted in Banff and Jasper National Parks so the campgrounds are very serious about educating the public on clean campsite practices. Banff campsites must be kept free of food and coolers anytime you are not present OR anytime you’re sleeping. The rangers drive through the campgrounds at night, and if you have left a cooler or food sitting outside they will pick it up and move it to an indoor location where you will later have to go pick it up (don’t be that guy)! Further north in Banff National Park is Lake Louise Campground. Lake Louise is another large campground with over 100 sites. At Lake Louise the RV campground has electric hookups. The Lake Louise campground was much prettier than Tunnel Mountain Village because it sits right on the bank of the Bow River. Our site was at the verrrrrry end of the campground, near a walking trail that runs right along the river. Indy really enjoyed this spot, though the ranger did warn us that grizzlies were common at the far end of the campground so never let your dog off leash. The only downside to the Lake Louise campground was the fact that the bathrooms are really far from some of the campsites. In the future we would request a campsite close to the bathroom. Rampart Creek was by far our favorite campground in Banff or Jasper. It’s a smaller campground located on the Athabasca River, and it is absolutely stunning. We were lucky enough to get a campsite right on the river, but every campsite hosts incredible mountain views. There are several more small campgrounds like Rampart Creek along the Icefields Highway, and the next time we road trip Banff and Jasper we plan to stay in more of those small campgrounds. In Jasper National Park camping is a bit more limited than in Banff National Park, and the campgrounds are not designed quite as conveniently as those in Banff. Wapiti campground is the closest campground to Jasper’s town center, and it has a walking/bicycle trail that allows you to bike into Jasper completely off-road. We always appreciate a good bicycle trail so this was a big factor in choosing this campground. At Wapiti we were once again lucky enough to get a campsite right on the river, and though the sites were pretty close together the scenery was beautiful. The biggest downside to Wapiti was the fact that there is just one shower building right by the entrance to the campground, and in a campground with hundreds of sites this meant we had to bicycle, drive, or walk about a mile to take a shower. This was only a minor inconvenience for us because we have our bicycles, but the tiny parking lot at the shower building was constantly full of cars and RVs, so that’s something to keep in mind if you camp at Wapiti campground. Overall our camping experiences in Banff and Jasper National Parks were very positive. The campgrounds were cleaner, more organized, and less expensive than National Park campgrounds in the states! Banff RV camping seemed a bit more convenient than the camping by Jasper, but we had a great time camping in both parks. 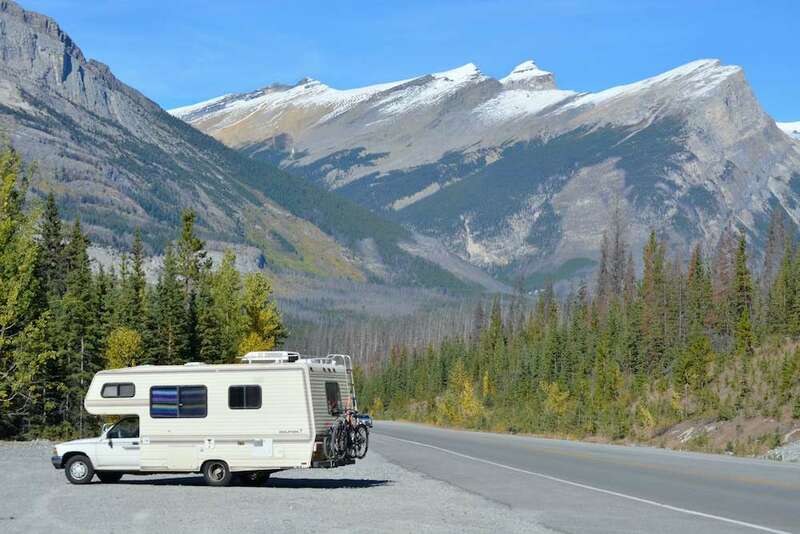 If you have trouble finding a campsite in Banff or Jasper, OR if you just prefer not to pay high campsite fees then overnight parking may be a better option for you. There are many turnouts and rest areas along the Icefields Parkway, which runs between Banff and Jasper. Every morning we saw campers parked in these turnouts, and the camping app iOverlander listed plenty of these turnouts as good places to park overnight. Free overnight parking in Jasper seemed to be plentiful! There are also overflow parking lots near Lake Louise that allow Banff overnight parking. 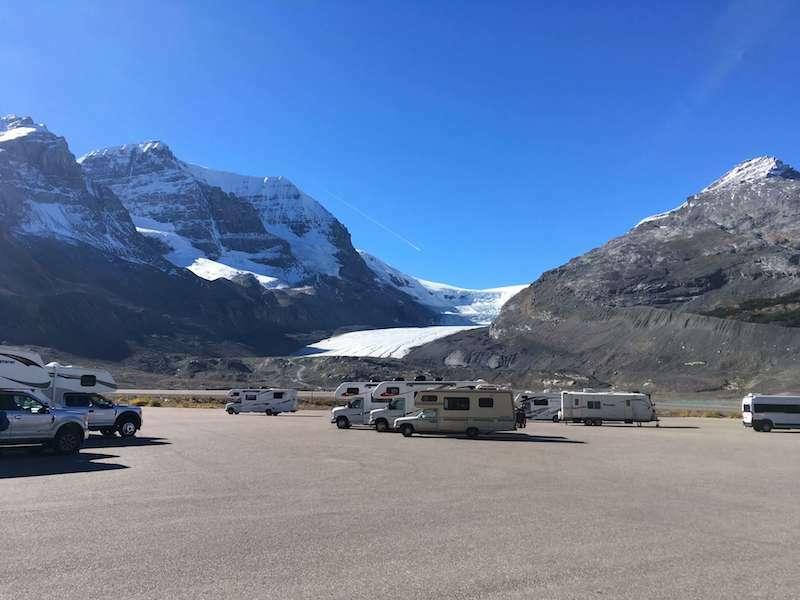 At the Icefield Center right across from the Columbia Icefield you can park overnight with an incredible view of the glacier for a small fee. This paid lot has garbage cans and pit toilets you can use as well. A good rule of thumb is to check for signs that prohibit overnight parking. As long as there are no signs prohibiting overnight parking then you should be able to park for the night without a problem. We really enjoyed our camper travel in Banff and Jasper National Parks, and highly recommend this road trip! For more information on camper travel in Banff and Jasper read how to avoid the crowds in Banff and Jasper National Parks and check out Camper Travel in Banff & Jasper: Getting Around. If you are planning your own Banff/Jasper camper adventure be sure to grab Lonely Planet's beautiful, comprehensive guide to the area! Is camper travel in your future? Be sure you have everything you need for your travels! Considering camper travel but have more questions? Check out these answers to our most frequently asked camper life questions!